The gasoline-electric ix-Metro has CO2 emissions of 80g/km. MUNICH -- Hyundai will give world debuts to a hybrid city car concept and a production-ready plug-in electric i10 minicar at the upcoming Frankfurt auto show. Called the ix-Metro, the SUV-styled city car concept is designed to showcase the automaker's new environmental technologies. The concept is powered by a gasoline-electric hybrid powertrain based on a 1.0-liter, three-cylinder engine featuring direct-injection, variable valve timing and a turbocharger, all combined with a six-speed dual-clutch gearbox. It has CO2 emissions of 80 grams per kilometer. 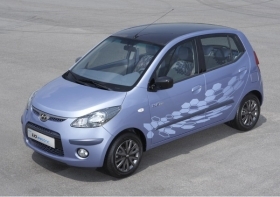 The i10 Electric is powered by a 49kW motor and a lithium ion 16kWh battery and has a range of nearly 170 km (100 miles). The car can be charged from a domestic supply using slow or fast cycle. Under the quick cycle, the battery can be recharged to within 85 percent of its capacity within 15 minutes. Under the normal cycle using a 220 Volt household current, 100 percent power will be attained within five hours. The i10 Electric will go on limited sale in Korea in the second half of 2010, but Hyundai says the prohibitive cost of batteries is a limiting factor for mainstream global sales. The cost of the car's battery pack alone is 10,000 euros, Goebel said in a statement. 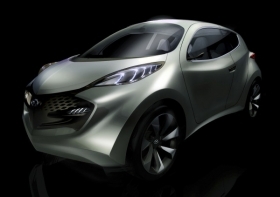 “We believe there will be a big market [for the i10 Electric] but the European market is not there yet," he added. The i10 Electric has a range of 100km.